De La Hoya sounds like he’s become intractable with his negotiating tactics. If De La Hoya doesn’t watch out, he’s going to negotiate Canelo out of a third fight with GGG. If De La Hoya uses the ‘It’s my way or the highway’ approach to negotiating the Canelo-GGG III trilogy fight, he’ll end up with nothing to show for it. Canelo would then have to fight someone like David Lemieux, Jermall Charlo or Daniel Jacobs on May 4. Of those three, Lemieux would have to be seen as having the best chance of getting picked by GB Promotions to fight Canelo on May 4. However, that’s not a fight that will bring in a massive amount of subscribers to DAZN. If what Golovkin’s trainer Abel Sanchez says is true about Canelo needing to bring in lots of subscribers to DAZN for him to finish the entire 11-fight, 5-year, $365 million deal, then that means he can’t afford to fight too many weak opponents like Fielding and Lemieux without stunting the amount of subscribers he pulls in. For boxing fans to want to pay $10 per month to subscribe to DAZN, they need to see Canelo fight good opposition as much as possible, and that means guys like Golovkin, Jermall Charlo, Daniel Jacobs, Callum Smith, Demetrius Andrade, Billy Joe Saunders, Jarrett Hurd, Jermell Charlo, Erislandy Lara, Jaime Munguia, Gilberto Ramirez and David Benavidez. Those guys should be the only ones that Canelo is focusing on fighting in order to bring in the most amount of subscribers to DAZN. De La Hoya says that besides GGG, Billy Joe Saunders, Daniel Jacobs and the Charlo brothers are all possible options for Canelo’s May 4 fight at the T-Mobile Arena in Las Vegas, Nevada. There was a time when those fighters were considered good contender/paper champions, but that was so long ago. Canelo fought most of them when they were on the downside of their careers, and not the same guys they were when they were at their best. Canelo has fought the 36-year-old Golovkin (38-1-1, 34 KOs) twice with both of their fights ending in controversy in Las Vegas. 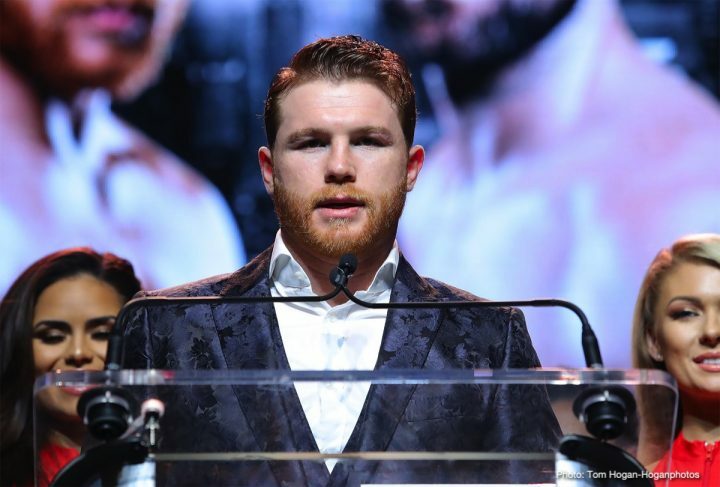 In between their two fights, Canelo tested positive for the prohibited substance clenbuterol last February, which he blames on having ingested tainted meat in Mexico. The tainted beef excuse didn’t fly with the Nevada State Athletic Commission nor did if go over well with the boxing public. The Nevada Commission suspended Canelo six months for his positive clenbuterol test. The fans laughed at Canelo, calling him a cheater, and wondering how long he’d been using the substance to get ready for his fights. Golovkin still agreed to fight Canelo in the rematch, but there was testing done to ensure that the two were on an even playing field. After the second controversial decision in the rematch, GGG wanted Canelo to commit to a third fight, but he and his promoters at Golden Boy chose to take the fight with WBA secondary super middleweight champion Fielding. The match-up has not caught on with the fans unfortunately. Hence, there’s now more talk of a third Canelo vs. GGG fight today than there is about Saturday’s Alvarez vs. Fielding fight. It was smart for Golden Boy Promotions to start talking about the third Canelo vs. GGG fight right about now, as it might help drive up interest in Saturday’s Canelo-Fielding fight. Name dropping GGG’s name is a smart thing for Golden Boy to do. Now they just need Canelo to help out by talking up a third fight with GGG as well. Canelo and Golden Boy could really help drive up interest in the Fielding fight if they were to make an early announcement now of the Canelo-GGG trilogy fight for May 4. Golovkin is on vacation right now, but there’s expected to be an announcement soon about which TV partner he’s going to be signing with. GGG has met with ESPN/Top Rank, Premier Boxing Champions at Fox/Showtime and DAZN. Most boxing fans expect Golovkin to sign with DAZN so that he can get a third fight with Canelo, but you never know. Golovkin might surprise the fans by signing with ESPN or Showtime/Fox. Golovkin will be fine no matter where he ends up. If GGG never fights Canelo again, his career will still be a successful one. Golovkin might even be better off if he doesn’t face Canelo again, as he might not have to worry about being involved in anymore controversial decisions. If the theory that many boxing fans have is correct about Canelo getting decisions because of his popularity rather than his talent, then the chances are that GGG will never get a decision over the Mexican star no matter how many times they fight each other.